The Blossman Custom Payment Plan is designed to keep you and your family comfortable all year long with hassle-free gas service. You’ll enjoy equal monthly payments free of interest charges, .10 cents per gallon below our lowest residential rate, interest earned on credit balances and the peace of mind that comes with our Worry-Free Guarantee. To provide equal monthly payments, Blossman estimates the total amount of gas you’ll use in a year and then spreads it out over 6, 9 or 12 months – your choice! Every quarter, Blossman compares your actual propane usage to the estimated amount and adjusts your payment if necessary. This helps us to begin each plan year free of large balances. Gas service with Blossman is worry-free. Gas delivery is automatic and your Blossman representative will monitor gas usage and manage your supply. If you ever run out of gas, we’ll give you up to 75 gallons for free with our Worry-Free Guarantee. Make easy online payments HERE. 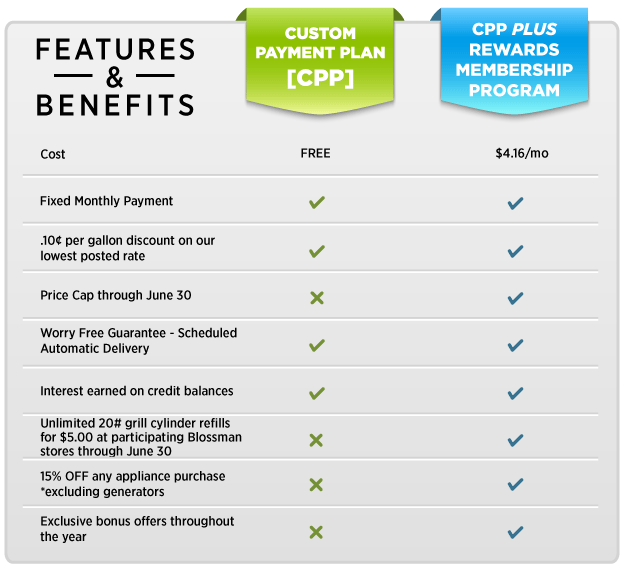 For more information on payment plans, call 1-888-BLOSSMAN or visit your nearest Blossman Gas store. To make a Blossman Gas online payment, CLICK HERE.